The President had outlined their next diplomatic moves: alert the American public about the crisis in a televised address; receive legal approval for the quarantine from the Organization of American States (OAS); and, finally, make their case to the world at the United Nations (UN). It was crucial that they secure approval for their actions from their allies. From a legal standpoint, unilateral action against Cuba would have seriously damaged their reputation, not to mention undermine their legitimacy as the moral leader of the world. As preparations got underway, the New York Times and Washington Post sensed that something was wrong and they began to investigate. When UN Ambassador Adlai Stevenson discovered that the papers were going to print the stories he alerted the President. Both papers agreed to withhold the story after receiving calls from the President, who asked that he first be allowed to present his course of action to the American public. On Monday October 22, the President remained faithful to his appointments. He even met with Prime Minister Milton Obote of Uganda, who was thoroughly “impressed” and taken by surprise when he watched the President’s speech to the nation and the world (Schlesinger, “A Thousand” 812). According to Wayne Fredericks, Deputy Assistant Secretary of State for African Affairs, the Prime Minister said: “I got one of the most impressive experiences of my life: For thirty minutes this afternoon I had the full and undivided attention of the President of the United States of America, and I had not the slightest inkling of the problems he was facing.” (Strober, 387) Though the President had the weight of the world on his shoulders, he still maintained his famous calm and cool composure. By giving time to Obote during this crisis, he signaled to the Prime Minister that he was dedicated to the issues confronting Africa. The President scheduled a meeting for five o’clock that same evening to explain their situation to Congressional leaders. Congressmen from all over the country were in their districts for re-election, but they did not mind being called back to Washington by the President. O’Donnell recalled one such congressman, “Hale Boggs [who] was fishing on the Gulf of Mexico. An Air Force helicopter picked him up from his boat and carried him to New Orleans, where an Air Force jet took him to Washington.” (O’Donnell, 327) Once everyone was assembled, the meeting began. John McCone kicked off the meeting by presenting the group with aerial photography and explaining their significance. McNamara and Rusk outlined their rationale for the naval quarantine, but it was quickly followed up with denouncements from all of the Congressional leaders. It seemed to those present that the congressmen were trying to outdo one another in their objection to the blockade. Senator Russell, the most vocal critics, attacked the plan as weak and demanded that the President immediately follow a military course of action. “It seems to me,” he said, “that we are at a crossroads. We are either a first-class power or we’re not.” (Dallek, 557) Senator Fulbright also attacked the plan as ineffective and asserted that a military strike against Cuba did not necessarily constitute an act of war against the Soviet Union (Dallek, 557). Unmoved, the President replied, “Last Tuesday, I was for an air strike or invasion myself, but after four more days of deliberations, we decided that was not the wisest first move, and you would, too, if you had more time to think about it.” (O’Donnell, 328) All of them had sided with the JCS on the matter, though a few of them signaled that they would support the President if they could make it part of the public record that they were not consulted before the final decision was made. Bobby, who did not attend the meeting, could see the frustration in his brother afterwards. As the door shut behind him, the President let his anger show: “Oh, sure, we’ll support you, Mister President. But it’s your decision not ours, and if it goes wrong we’ll knock your block off.” (O’Donnell, 328) As the President changed his clothes for the televised address, he muttered half to himself: “If they want this job, they can have it—it’s no great joy to me!” (Sorensen, 703) It seemed clearer and clearer each day that he was one of the few people who were fighting for peace. As the time approached, the President readied himself to make the most important speech of his life. At 7:00 p.m., the President appeared on over one hundred million television screens across America. Looking grim and speaking in somber tones, he began: “Good evening, my fellow citizens. This Government, as promised, has maintained the closest surveillance of the Soviet military buildup on the island of Cuba. Within the past week, unmistakable evidence has established the fact that a series of offensive missile sites is now in preparation on that imprisoned island. The purpose of these bases can be none other than to provide a nuclear strike capability against the Western Hemisphere.” (Kennedy, 149) He carefully explained the nature of the crisis and explained the risks posed by the missiles and the sites. Not only were these missiles dangerous, but their existence in Cuba represented the duplicity and the deception of the Soviet Union. They were also put there in violation of the Rio Pact of 1947. The President’s speech earned him the immediate support from their NATO allies. It had been watched all across the globe in 38 different languages (Sorensen, 704). The next morning, Secretary of State Dean Rusk awoke Undersecretary of State George Ball, who had fallen asleep on the couch in his State Department office by saying, “We have won a considerable victory. You and I are still alive.” (Dallek, 559) On this day, Rusk was scheduled to make the case for the quarantine before the Organization of American States, while UN Ambassador Adlai Stevenson was to make their case before the UN. Behind the scenes, the CIA and ExComm members were out trying to rally support among congressional leaders for the President’s plan. All their efforts were successful. Dean Rusk, “in his finest hour”, was able to obtain a unanimous vote of approval for the President’s quarantine (Dallek, 560). Stevenson, in a dramatic confrontation with Russia’s UN Ambassador Valerian Zorin, was successful in proving to the world that the Soviet Union had indeed placed missile sites on the island of Cuba. He demanded to know if the Soviets had placed the missiles in Cuba, but Zorin refused to answer. Stevenson then gave his historic retort, “I am prepared to wait for my answer until hell freezes over!” (Dallek, 565) Without waiting for a reply, Stevenson presented the aerial photographs of the Russian missile sites to the Security Council, which earned the United States credibility in its claims. The ExComm and CIA were successful in convincing the skeptics and the public that their efforts were justified. The ExComm was split between “hawks” and “doves,” though these were not terms used during the crisis. It should be noted, however, that the initial majority opinion was in favor of a military strike to remove the missile sites (Kennedy, 25). 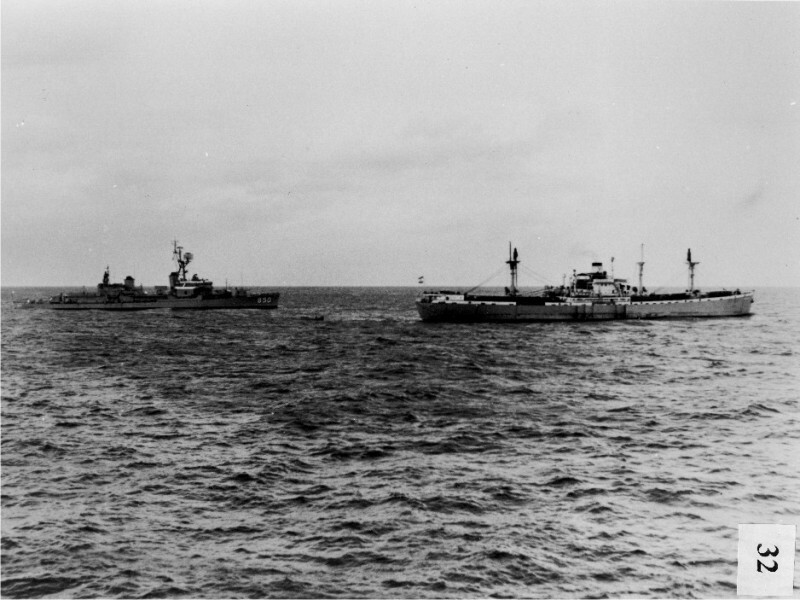 After subsequent discussions over the course of the first couple of days, a second option surfaced: a naval blockade. 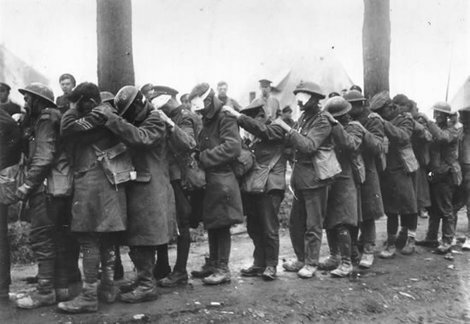 A naval blockade is actually an act of war, so, for legal reasons, the group termed the action “quarantine”. This option resulted in the split that divided the group into “hawks” and “doves”. The hawks were led by Dean Acheson and the Joint Chiefs of Staff; the doves were led by Bobby and Robert McNamara. Somehow, these men were supposed to find common ground. The doves argued strongly for the naval blockade, or “quarantine”. The quarantine would exert the necessary pressure on Russia, but it was an option that “(allowed) the Soviets some room for maneuver to pull back from their over-extended position in Cuba.” (Dallek, 556) If necessary, they argued, the military option was still on the table. Robert McNamara stressed that there was no guarantee, in the event of a military strike, that all of the missile sites would be known, especially considering that they did not know whether or not more sites existed (Kennedy, 27). For Bobby, the military strike was morally unacceptable as it “would rain bombs on Cuba, killing thousands and thousands of civilians in a surprise attack,” a course of action that was not in the American tradition (Kennedy, 29). The American public, nor the rest of the world, would tolerate a “very big nation” blasting a “very small” nation back to the stone age in an act that was reminiscent of Pearl Harbor. Bobby’s position is greatly different from his views just before the crisis broke out, according to Gaylord Nelson who said that Bobby remarked, “What we really should do is make a strike—a huge strike and knock ‘em right out of business.” (Strober, 377) The implication, therefore, is that Bobby’s contradictory position during the ExComm meetings reflected President Kennedy’s behind the scenes opinion. Later that night, in order to maintain secrecy, the ExComm piled into Bobby’s car and drove to the White House. They had all agreed to the blockade proposal before they left for the White House, but that did not last. The group was presented with new aerial photographs that showed that the Soviets were constructing sites to launch intermediate medium range ballistic missiles. The group focused their discussion on whether or not they should act immediately to this new information, which lead to discussions about how and where the Soviet Union would retaliate. Dean Rusk also expressed concerns about how our allies might be affected: “The action also has to be thought of in connection with alliance solidarity, there we’re faced with conflicting elements. Unless we’re in a situation where it is clear that the alliance has worked to understand the problem, then unannounced, unconsulted quick action on our part, could well lead to a kind of odd disunitiveness the Soviets could capitalize upon very strongly.” (Historic Documents) The President then engaged the group in a discussion about whether or not they should alert the Soviet Union before they make any decision, but he seemed t answer his own question: “If we gave say this 24-hour notice, get in touch with Khrushchev, taking no action with our allies. I would assume that they would move these mobile missiles into the woods.” (Historic Documents) McNamara responded by saying that he doubted the Soviets, at this point, could dismantle the sites, especially since it had taken them so long to erect them in the first place. When the subject of the blockade finally came up, the President was still concerned about how they planned to remove the missiles from the island. Llewellyn Thompson suggested that they declare war or find some sort of legal basis that would not only force the Soviets to dismantle the sites, but it would also justify any future actions the U.S. might make to punish them for their defiance. Playing the role of devil’s advocate, Bobby states: “the argument against the blockade is that it’s very slow death, and it kills up, and goes over a period of months, and during that period of time you’ve got all these people yelling and screaming, examination of Russian ships and shooting down of Russian planes that try to land there, you have to do all those things.” (Historic Documents) An unidentified voice asserts that any blockade of Cuba would most assuredly prompt the Soviets to retaliate by blockading Berlin. The meeting ends without any final decision and the President sends the ExComm back to their offices to develop their arguments. Early in 1962, President Kennedy read Barbara Tuchman’s book The Guns of August, a startling account of the outbreak of World War 1. The President was so shocked by what he read that he required his Cabinet members and the National Security Council to read the book. He even gave a copy to England’s Prime Minister Harold Macmillan (Tuchman, vii). Secretary of Defense Robert McNamara recalled that the President explained how the book “graphically portrayed how Europe’s leaders had bungled into the debacle of World War 1. And he emphasized: ‘I don’t ever want to be in that position… we are not going to bungle into war.’” (McNamara, 96) Attorney General Robert F. Kennedy (referred to as Bobby) recalled in his memoir Thirteen Days that the President had criticized Europe’s leaders who “seemed to tumble into war… through stupidity, individual idiosyncrasies, misunderstandings, and personal complexes of inferiority and grandeur.” (Kennedy, 49) Contrary to the assertions made by revisionists Hagan and Paterson, the President was not attempting to flex his military muscle or to provoke a nuclear showdown. According to Bobby, on the night of October 26, 1962, the President spoke to him about the historical implications of their actions: “If anybody is around to write after this, they are going to understand that we made every effort to find peace and every effort to give our adversary room to move. I am not going to push the Russians an inch beyond what is necessary.” (Kennedy, 98) Clearly, Barbara Tuchman’s book, and the lessons it contained, had an enormous influence on the manner in which the President approached each crisis, particularly during the Cuban Missile Crisis. The primary documents and oral histories provide clear and ample evidence that he was determined not to go down in history as the President who bungled his way into nuclear war. 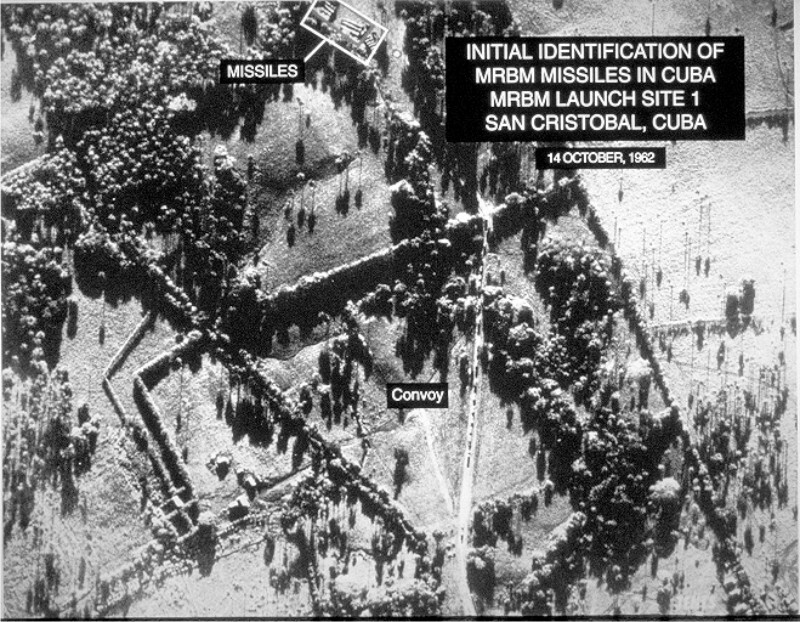 The Soviet Union began moving missiles into Cuba in the summer of 1962, which US intelligence detected in August, after having received assurances from President Kennedy that he would halt all U-2 reconnaissance flights “over Soviet ships in the Caribbean.” (Dallek, 537) By September, it was becoming clearer and clearer that the Soviets were not being entirely honest with their claims that they were only providing defensive armaments to Cuba. On September 4, Bobby held a meeting with Soviet Ambassador Anatoly Dobrynin: “I told him that we were deeply concerned within the Administration about the amount of military equipment being sent to Cuba… there was some evidence that, in addition to the surface-to-air-missile (SAM) sites that were being erected, the Russians, under the guise of a fishing village, were constructing a large naval shipyard and a base for submarines.” (Kennedy, 20-21) Ambassador Dobrynin assured the Attorney General that the Soviet Union “would do nothing to disrupt the relationship of our two countries during this period prior to the elections.” (Kennedy, 21) To make the point even clearer, the President issued a statement warning the Soviet Union against the introduction of offensive weapons into Cuba. A week later, on September 11, the Soviet Union issued a statement of their own assuring the US that there would be no such course of action and that they had no intention of exporting nuclear weapons to Cuba: “There is no need for the Soviet Union to shift its weapons for the repulsion of aggression, for a retaliatory blow, to any other country, for instance, Cuba. Our nuclear weapons are so powerful in their explosive force and the Soviet Union has so powerful rockets to carry these nuclear warheads, that there is no need to search for sites for them beyond the boundaries.” (Schlesinger, “A Thousand” 799) They also went on to accuse that the US was “preparing for aggression against Cuba and other peace-loving states.” (Schlesinger, “A Thousand” 799) The web of lies and deceit had been spun, but the US had not yet been caught in it. As a precaution, the President stepped up U-2 reconnaissance flights over Cuba. 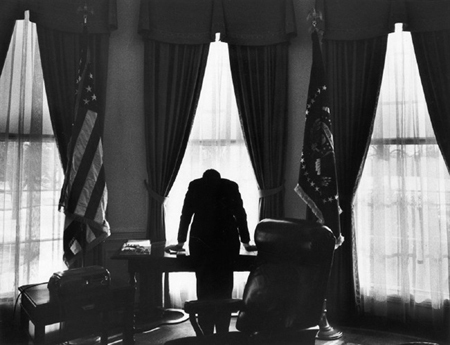 The Cuban Missile Crisis, for the U.S., started at 8:45 am on Tuesday, October 16, 1962. National Security Advisor McGeorge Bundy presented President Kennedy with the news that a U-2 spy plane had photographed evidence of offensive weapons on the island of Cuba. 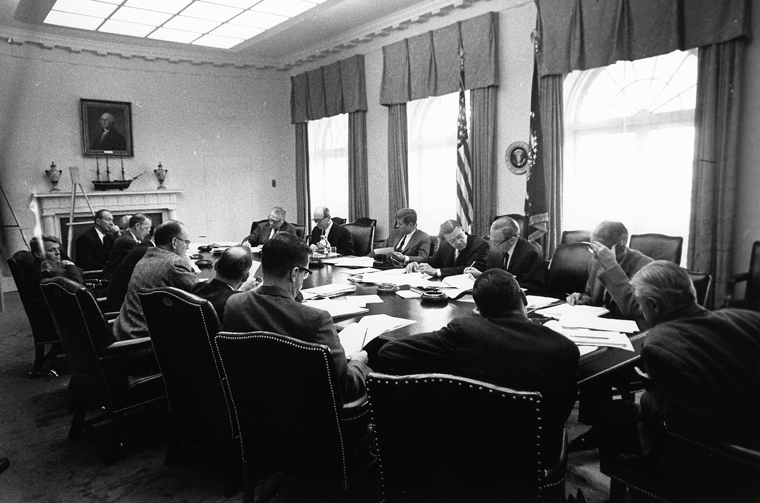 In that first hour, President Kennedy made three crucial decisions: the information was to be shared with only a select few individuals; these individuals would convene for high level meetings to discuss policy and strategy; and, lastly, that everyone should be mindful to keep their appointments, lest they rouse the suspicions of journalists. The President wanted to maintain absolute control over the situation. Pierre Salinger, the White House Press Secretary, explained that President Kennedy wanted to make a decision before he let the “American people… know about the crisis.” (Strober, 379) He was concerned about pressure to act before he had time to consider all of his options. During this meeting, the ExComm was presented with the aerial photography and listened as experts explained the readiness of the sites. 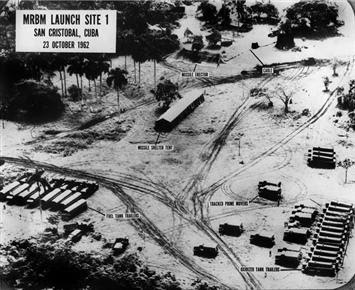 The 928 pictures looked like football fields to the President and Bobby, but General Marshall Sylvester Carter (Deputy Director of the CIA) explained that the photographic evidence revealed the existence in Cuba of missile sites that were under construction at San Cristobal and Guanajay, Cuba, not to mention twenty-one crated IL-28 medium range bombers. They also admitted that they had no idea when these sites would become operational. 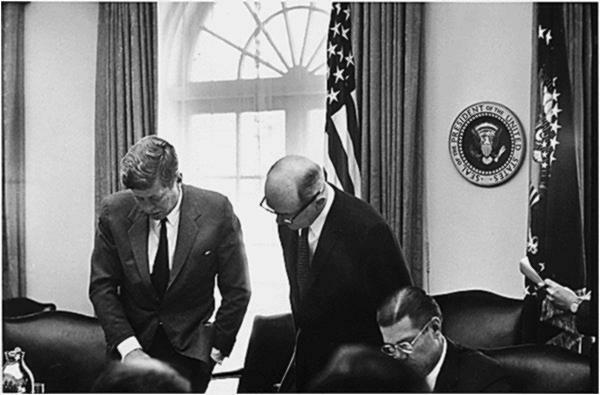 President Kennedy pressed the ExComm advisors to explain Krushev’s motivation for placing the missile sites in Cuba and how they thought these missiles would be removed. Looking back, Dean Rusk said: “We never really knew the answer to that question.” (Strober, 388) During this meeting, however, Rusk proposed that Khrushchev might be trying “to bargain Berlin and Cuba against each other.” (Dallek, 547) Ted Sorensen, the President’s speechwriter and adviser, wrote that there were five theories: (1) That Khrushchev was testing the will of the administration by playing Cold War politics; (2) That Khrushchev was setting a trap that would force the U.S. to respond with violence against “little Cuba and provide the Soviet Union room to move against Berlin; (3) That Khrushchev was trying to protect its ally in the Western Hemisphere against what they thought would be an inevitable invasion; (4) That Khrushchev was using the missile sites as a bargaining tool for future settlements on Berlin; (5) That Khrushchev was trying to compensate for the missile gap by placing the missiles so close to the American mainland that they would “by-pass most of our missile warning systems permitting virtually no time between their launch and their arrival on target.” (Sorensen, 677-678) When the President requested opinions on their response, he received a range of opinions that included doing nothing, responding with massive military force, or blockading the island. Overwhelmingly, the group was in favor of a military strike. This also seemed to be the President’s initial choice, but he was not yet ready to make his decision. As the meeting wore on, Bobby passed a note to the President: “I now know how Tojo felt when he was planning Pearl Harbor” (Kennedy, 25). The Kennedy brothers confer during the crisis. It was only through John F. Kennedy’s leadership that the world narrowly avoided nuclear oblivion. The temperature of the Cold War was turned way up when the United States discovered that the Soviet Union had begun construction on several new nuclear sites on the island of Cuba, just 90 miles south of Florida. By the end of the thirteen day stand-off in the Caribbean waters around Cuba, the U.S.S.R. promised to remove the missile sites if the U.S. promised not to invade the island. President Kennedy’s careful judgment was predicated on his ability to empathize and respect his adversary, his ability to weigh all the advice given to him, and his hesitation to use violence as a means to an end. One can only speculate about the holocaust that would have been wreaked on civilization had President Kennedy not been elected in 1960. This thesis, however, is not shared by many revisionist historians who reject any claims that the crisis represented President Kennedy’s finest hour. The reassessments by these historians place full blame for the crisis on President Kennedy’s shoulders, and virtually give the Communist cohorts, Cuba and the Soviet Union, a pass. President Kennedy, they charge, unnecessarily brought the crisis to the brink of nuclear war in order to appear tough on communism during mid-term elections. They are also quick to point out that the memoirs of those involved in the crisis (Robert Kennedy, Ted Sorensen, Arthur Schlesinger Jr, Walt Rostow, etc.) are all biased accounts that tend to view the President more positively than objectively, and are thus not suitable for any constructive discussion of the Cuban Missile Crisis. These individuals, by implication, have done an injustice to the historical record by creating a false image of the President during those thirteen days. In the final analysis, these revisionists are guilty of ascribing motives to individuals where there is no evidence for such assertions. Thomas G. Paterson, a revisionist historian, has been very critical of President Kennedy’s handling of the missile crisis. According to Paterson, Professor Emeritus at University of Connecticut, President Kennedy recklessly took the route of confrontation when the route of diplomacy was readily available to him. Why would President Kennedy take this route? In Paterson’s essay Bearing the Burden: A Critical Look at JFK’s Foreign Policy, he states: “The president’s desire to score a victory, to recapture previous losses, to flex his muscle, accentuated the crisis and obstructed diplomacy… Kennedy gave Khrushchev no chance to withdraw his mistake or to save face… He left little room for bargaining but instead issued a public ultimatum and seemed willing to destroy, in Strangelovian fashion, millions in the process.” The appearance of being weak or hesitant to act during an election season was unacceptable, so, according to his assertions, Kennedy built up the threat to be more dangerous than it actually was. Following the disastrous Bay of Pigs debacle, the Kennedy administration was eager for a confrontation that would demonstrate their power and superiority over the Soviets. Paterson concludes that President Kennedy was not the cool and collected decision maker that his adherents have maintained; Instead, President Kennedy was vain, reckless, and impatient, all of which generated the tensions that could very well have resulted in nuclear war. Another proponent of this theory is Roger Hagan, who has asserted that it was Kennedy’s arrogant and hostile Cuban policies that forced Soviet Premier Nikita Khrushchev to put missiles on the Cuban island. Like Paterson, Hagan states that “Politics, toughness, a sense of nakedness and military peril, a sense of being tested, silly rage, all were probably mingled into an unanalyzed conviction of the necessity of our action.” Cowboy diplomacy, in other words, was exercised by the President so that he would not appear soft on communism, a position that would have left him weak politically. In the book The Crisis years, Michael Beschloss asserts that the President’s legacy enjoyed, for some time, an immunity from criticism. The Kennedy White House is described as being at fault for creating an official version of events and then cementing that version into the minds of several generations of Americans who were “relieved by the peaceful end to the crisis, [and] were eager to accept” the White House story (Beschloss, 564). Had the President lived in more modern times, Beschloss writes, he “would not have been so lucky.” (Beschloss, 564) The American people, he argues, ate up the “drama” over the missiles because it was more “comprehensible” than the “abstractions of Berlin.” (Beschloss, 568) By implication, if the public were not so ignorant they would have seen that their President was “(responsible) for provoking the crisis” to begin with (Beschloss, 568). The fact that the public bought the “official version” emboldened President Kennedy’s political status and his appearance of being tough on communism (Beschloss, 568). Arthur Schlesinger jr criticized the revisionist historians in his memoir of Robert Kennedy. He points out that the left-wing revisionists portray him as a President “driven by psychic and political compulsions to demand unconditional surrender at whatever risk to mankind,” while the hard-liners, such as Dean Acheson, during the crisis thought “him fatally soft.” (Schlesinger, “Robert Kennedy” 554) This appears to be a paradox. Schlesinger, one of the people Paterson accuses of being a perpetuator of the Kennedy legacy, argues that the very individuals that faced off against the President during the crisis thought that he was striving for peace. Khrushchev, for example, wrote that Kennedy “was a man who understood the situation correctly and who genuinely did not want war… Kennedy was also someone we could trust… He showed great flexibility and, together, we avoided disaster… He didn’t let himself become frightened, nor did he become reckless… He showed real wisdom and statesmanship.” (Schlesinger, “Robert Kennedy” 554). He also quotes Cuban President Fidel Castro, who was speaking to Herbert Matthews: “[Kennedy] acted as he did partly to save Khrushchev, out of fear that any successor would be tougher.” (Schlesinger, “Robert Kennedy” 554) The point Schlesinger is trying to make is that the people who were closest to the President and those who went toe-to-toe with him better understood his motivations than those historians who would attempt to ascribe motives to a person they did not know in a situation they did not participate in. Having the benefit of hindsight, these revisionist historians overcompensate for the Kennedy legacy following his assassination by trying to destroy his legacy altogether. Those who watched the debate on television claimed Kennedy had won. Those who listened to the debates on the radio claimed Nixon had won. The legacy began when Senator John F. Kennedy narrowly defeated Vice President Richard M. Nixon in the Presidential election of 1960, much to his consternation. However, over the next seventy days, Senator Kennedy transitioned into President Kennedy, earning him a 75% approval rating in the days following the inauguration. Following the election, President-elect Kennedy reached out to President Eisenhower, seeking his advice on two separate occasions about a range of issues. Though the President-elect came away from the meeting unimpressed with the elder statesman’s grasp of the issues, the President gained a new appreciation for Kennedy’s talent and intelligence. He wrote to Clark Clifford in a memo: I had been “misinformed and mistaken about this young man. He’s one of the ablest, brightest minds I’ve ever come across.” (Dallek, 303) President-elect Kennedy also made a show of political unity by meeting privately with Nixon, though, he admitted to Kenneth O’Donnell, “I haven’t the slightest idea” about what to discuss with him, which turned out fine because Nixon did most of the talking during their meeting. The inaugural balls, however, introduced the country to the Kennedy clan and their attractive beauty and youthful vigor. The country, as well as the world, fell in love with the grace and style of the Kennedys. Keep following my blog. Part 2 of the Cuban Missile Crisis series will be posted soon!